1 At the invitation of H.E. 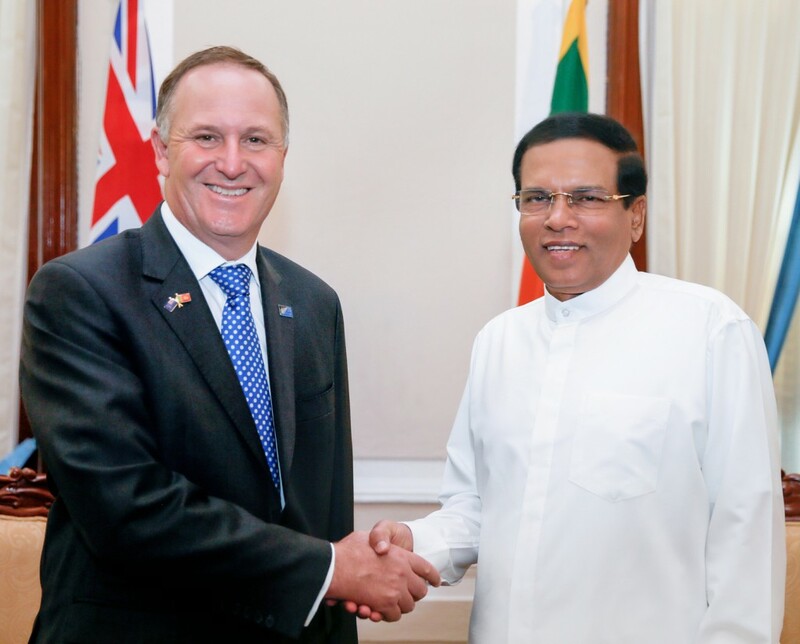 Maithripala Sirisena, President of the Democratic Socialist Republic of Sri Lanka, the Rt Hon Mr John Key, Prime Minister of New Zealand, paid an official visit to Sri Lanka from 23-27 February 2016. During the visit, Prime Minister Key held official meetings with President Sirisena and Prime Minister Ranil Wickremesinghe in Colombo. 2 Following their meeting, President Sirisena and Prime Minister Key expressed their satisfaction at the close and warm relationship that Sri Lanka and New Zealand have forged, and outlined their vision to further enhance the bilateral relationship in the years ahead. The two leaders agreed that, following Prime Minister Key’s visit, Sri Lanka and New Zealand would continue a practice of holding regular meetings at the political and senior officials’ levels. 3 President Sirisena and Prime Minister Key noted the similarities that Sri Lanka and New Zealand share, as multi-ethnic island nations with a Commonwealth heritage.They underlined that Sri Lanka and New Zealand had a shared commitment to contributing to the prosperity of the Asia-Pacific region, while building strong, diverse economies for the needs of their citizens. 4 The leaders noted that Sri Lanka and New Zealand had a shared commitment to combating security challenges in the Asia-Pacific, including people smuggling, trafficking in persons, transnational crime, terrorism and illegal fishing, in the context of the ASEAN Regional Forum. The two leaders also welcomed Sri Lanka and New Zealand’s co-chairing of the Bali Process Working Group on the Combatting of People Smuggling and Trafficking in Persons Networks. 5 President Sirisena and Prime Minister Key noted that Sri Lanka and New Zealand were strong supporters of the global, multilateral system which underpinned the ability of small states to promote and preserve their interests. President Sirisena expressed appreciation for New Zealand’s important contribution as a non-permanent member of the United Nations Security Council, and thanked New Zealand for its support for Sri Lanka’s candidature to the UNESCO Executive Board. The two leaders pledged to work together and consult closely on UN-related issues of mutual importance. 6 Prime Minister Key commended the Government of Sri Lanka’s commitment to national reconciliation, including the process of constitutional reform. New Zealand’s Prime Minister recalling the support expressed by his Government for Sri Lanka last year in the United Nations Human Rights Council, reiterated its continued support for Sri Lanka’s outreach to engage constructively with the international community on its reconciliation efforts. 7 President Sirisena and Prime Minister Key welcomed the important people-to-people links between Sri Lanka and New Zealand, noting that almost 12,000 Sri Lankans were settled in New Zealand. The leaders also welcomed the fact that tourist flows between their two countries were increasing significantly, with almost 8,000 New Zealanders visiting Sri Lanka and almost 2,500 Sri Lankans visiting New Zealand in 2015. They further welcomed the Air Services Agreement between New Zealand and Sri Lanka that has provided code share connectivity for travellers between the two countries. A NZ$3.3 million extension to the Wanni Dairy Regeneration Activity, which helps communities in northern Sri Lanka affected by the conflict to generate sustainable agricultural income. 9 President Sirisena welcomed the role that New Zealand’s dairy industry has played in Sri Lanka for over 45 years. In this regard, the two leaders welcomed the opening of the New Zealand dairy cooperative Fonterra Demonstration Farm and Training Centre in Pannala, in the North Western Province of Sri Lanka, during Prime Minister Key’s visit. The centre aims to contribute to the strengthening of the Sri Lankan dairy industry. 10 The two leaders discussed the issue of tariffs applied to imported dairy products and welcomed dairy development partnership initiatives in Sri Lanka. The Government of Sri Lanka will review its tariff structure and will bring dairy tariffs in comformity with WTO levels by mid-year. 11 President Sirisena and Prime Minister Key emphasised their shared interest in the effective functioning of the WTO rules-based multilateral trading system, and, in that context, welcomed the successful outcome of the 10th WTO Conference held in Kenya in December 2015. Prime Minister Key offered his government’s support for providing training to Sri Lankan trade officials in New Zealand so that they could learn from New Zealand’s broad experience in trade liberalisation and trade negotiations. 12 President Sirisena and Prime Minister Key noted the broad range of commercial engagement between Sri Lanka and New Zealand, including quality Sri Lankan exports, such as tea and cinnamon, which are well known to New Zealanders. They noted the business agreements signed during Prime Minister Key’s visit, on refridgeration technology and equipment, power supply monitoring software, and potential deals in infrastructure and entertainment software. They welcomed the announcement of the establishment of the Sri Lanka-New Zealand Business Council in New Zealand, as a counterpart to the Sri Lanka, Australia, New Zealand Business Council in Colombo. 13 The two leaders commended the existing education ties between the two countries, with nearly 1,000 Sri Lankan students studying in New Zealand last year. They welcomed the collaboration being forged by New Zealand and Sri Lankan educational institutions, including in veterinary education, pilot training, and accountancy. 14 Prime Minister Key and President Sirisena commended the cooperation between New Zealand’s Auckland Zoo and Sri Lanka’s Department of National Zoological Gardens. The two leaders welcomed the exchange of letters between Sri Lanka’s Minister of Sustainable Development and Wildlife and New Zealand’s Chairman of Regional Faciltities, Auckland, regarding assistance by New Zealand, including financial resources for capacity building and training in the areas of Sri Lanka’s animal health and conservation. Prime Minister Key thanked the Government of Sri Lanka for its gifting of the Sri Lankan elephant named Anjalee from the Pinnawala Orphanage to Auckland Zoo in 2015, and for the gift of the second elephant named Nandi in 2016. 15 President Sirisena and Prime Minister Key noted the shared love of sport, especially cricket and rugby that New Zealand and Sri Lanka enjoy, and wished their respective teams well in the upcoming T20 Cricket World Cup in India in March 2016. 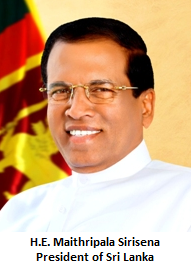 16 Prime Minister Key thanked President Sirisena, Prime Minister Wickremesinghe, and the Government and people of Sri Lanka for their generous hospitality accorded during his official visit. He invited President Sirisena and Prime Minister Wickremesinghe to make official visits to New Zealand in the near future.